It seemed that since the Turkish positioning after the battle of Aleppo and the launch of Astana path Ankara knew how to play its cards at the appropriate time, how to stop at the expected Russian US intersection, and how to arrange its cards quietly with Russia as an active regional partner, depending on being the traditional ally of America in the NATO. Because the table has one left seat from the opposite bank of Iran in the region, Turkey rushed to the Russian-Turkish-Iranian tripartite meeting and presented it as a new reference for the new Middle East, but when the new US administration stumbled through its proceeding toward Russia, as was suggested by the enthusiasm of the President Donald Trump for the resolving of ISIS. Ankara stopped its movement and positioned at the line of escalation against Iran in order to keep up with the US discourse. Through Geneva Talks it tried to pass the time waiting for the effective US movement according to timing of Washington not the timing of Moscow. As the Turkish acceleration was towards Astana path to get Saudi Arabia out of the parallel seat to Iran, as the coup was on Astana through the visit of the Turkish President to Saudi Arabia to rehabilitate it and to give it its status. Turkey found itself in a deadlock after the battle of Al –Bab which it waged for its own account and without the knowledge of Moscow and the promised pledges, in an attempt to bypass what is supposed to be done by the Syrian army after the battle of Aleppo, in addition to its coup on Astana path, so the Turks found that the Syrian army is preceding them in Al Bab towards the lines of the deployment of the Kurdish forces and leaving them alone, making a primary barrier between them and the units that belong to the Turks as the militias of the Shield of Euphrates which descendant of Wahhabi origins as branches of Al-Qaeda organization that work under the banner of Ankara, which are not reassured neither by the Russians nor the Americans. The Syrian army blocked the way which was drawn by the Turkish President in order to enter Raqaa across Manbej in front of Turkey as a temptation for the Americans to give him the green light to enter Manbej and getting the Kurds out of it. The Kurds announced their demand of the deployment of units from the Syrian army in many demarcation villages in which the Kurds live. The events occurred quickly and Turkey became in isolation unable to move forward in the battle of Manbej, after Russia and America became on the line directly, and it is unable to participate in the war on ISIS despite its losses when it announced the war on the organization which it sponsored and thinking that it is enough credentials for the Americans to sell it the Kurds. Despite the meeting of the chiefs of staff of America, Russia and Turkey the Turkish discourse is still escalating against the Kurds. Turkey seems on the eve of the visit of its President to Moscow in a state of embarrassment and in front of difficult choices. In coincidence with the Turkish confusion, Saudi Arabia succeeds in recapturing its status at the Americans contrary to the Presidential speech during the elections. The new administration seems that it handed over the regional policies to the tripartite; the Pentagon, CIA, and the diplomacy which the Saudis have considerations and effects on them. Saudi Arabia has surpassed through surprising indicators the escalated relationship with Iran which is still in its beginning, but it is meaningful. In conjunction with the announcement of the return of the peaceful endeavors to solve the crisis in Yemen, the Iranian Foreign Minister Mohammed Jayad Zarif visits Doha announcing a successful visit for the sake of Iranian-Gulf dialogue, and the Advisor of the Foreign Ministry Hussein Sheikh Al Islam who is closer to the decision –makers announced his optimism regarding the results of the talks of Iran’s resumption of its participation in the next pilgrimage season. Will Turkey and Saudi Arabia exchange the seats once again? – منذ التموضع التركي بعد معركة حلب وانطلاق مسار أستانة بدا أن أنقرة عرفت كيف تلعب أوراقها في التوقيت المناسب، وتقف عند التقاطع الروسي الأميركي المتوقع، وترتّب أوراقها بهدوء مع روسيا كشريك إقليمي فاعل، وتنطلق من كونها في الناتو حليفاً تقليدياً لأميركا، ولأن الطاولة تنتظر مقعداً واحداً من الضفة المقابلة لإيران في المنطقة، سارعت تركيا لاجتماع موسكو الثلاثي الروسي التركي الإيراني وتقديمه كمرجعية جديدة للشرق الأوسط الجديد، وعندما تعثرت الإدارة الأميركية الجديدة في تقدمها نحو روسيا كما كانت توحي حماسة الرئيس دونالد ترامب للحسم مع داعش، فرملت أنقرة حركتها وتموضعت على خط التصعيد بوجه إيران لتتماشى مع الخطاب الأميركي وتلاقيه، وسعت في محادثات جنيف لتمرير الوقت بانتظار الحركة الأميركية الفاعلة، وفقاً لتوقيت واشنطن لا توقيت موسكو، وبمثل ما كان الإسراع التركي نحو مسار أستانة إخراجاً للسعودية من مقعد اللاعب الموازي لإيران، كان الانقلاب على أستانة من منبر زيارة الرئيس التركي للسعودية ليردّ لها الاعتبار والمكانة. – وجدت تركيا نفسها في مأزق كبير بعد معركة الباب التي خاضتها لحسابها ومن وراء ظهر حسابات موسكو والتعهّدات المقطوعة لها، وفي محاولة تجاوز لما يفترض أن يقوم به الجيش السوري هناك بعد حلب، هذا عدا عن انقلابها على مسار أستانة، فاستفاق الأتراك على الجيش السوري يتخطاهم في الباب ويتركهم بداخلها متقدماً نحو خطوط انتشار القوى الكردية، مقيماً حاجزاً أولياً بينهم وبين الوحدات التابعة للأتراك من ميليشات درع الفرات، المتحدّرة من أصول وهابية كتفرعات لتنظيم القاعدة تعمل تحت لواء أنقرة، والتي لا يطمئن لها الروس والأميركيون، وأغلقت على تركيا الطريق عبر منبج التي رسمها الرئيس التركي لدخول الرقة كإغراء للأميركيين لمنحه الضوء الأخضر لدخول منبج وإخراج الأكراد منها، فقد أعلن الأكراد مطالبتهم بنشر وحدات للجيش السوري في عديد من قرى التماس التي يوجد فيها الأكراد، وتدحرجت الأحداث لتجد تركيا أنها في عزلة، عاجزة عن المضي قدماً في معركة منبج وقد صارت روسيا وأميركا على الخط مباشرة، وعاجزة عن المشاركة في الحرب على داعش رغم ما تكبّدته من خسائر بإعلان الحرب على التنظيم الذي رعته وفي ظنّها أنها أوراق اعتماد كافية لدى الأميركيين ليبيعوها رأس الأكراد. ورغم اجتماع رؤساء الأركان الأميركي والروسي والتركي لا يزال الخطاب التركي تصعيدياً ضد الأكراد، وتبدو تركيا عشية زيارة رئيسها إلى موسكو في وضع حرج وأمام خيارات صعبة. – بالتزامن مع الارتباك التركي تنجح السعودية باسترداد مكانتها عند الأميركيين خلافاً للخطاب الرئاسي خلال الانتخابات. فالإدارة الجديدة تبدو قد سلمت السياسات الإقليمية لثلاثي البنتاغون والـ»سي أي أيه» والدبلوماسية، التي يحتفظ السعوديون بحسابات وتأثيرات فيها وعليها، وتخطّت السعودية بمؤشرات لافتة العلاقة التصعيدية مع إيران التي لا تزال في بداياتها، لكنها ذات معنى. فبالتزامن يعلن عن عودة المساعي السلمية لحل الأزمة في اليمن، ويزور وزير الخارجية الإيراني محمد جواد ظريف الدوحة معلناً عن زياترة ناجحة لحوار إيراني خليجي إيجابي، ويعلن مستشار وزارة الخارجية حسين شيخ الإسلام القريب من مصادر القرار عن التفاؤل بنتائج مباحثات استئناف إيران مشاركتها في موسم الحج المقبل. March 13, 2017 “Information Clearing House” – Damascus, SANA-President Bashar al-Assad said that the solution to the crisis in Syria should be through two parallel ways: the first one is to fight the terrorists, and this is our duty as government, to defend the Syrians and use any means in order to destroy the terrorists who’ve been killing and destroying in Syria, and the second one is to make dialogue. Is Israel Planning Another War on Lebanon? The Turkish President Recep Erdogan will arrive to Moscow after his mission has been changed from the incitement against Iran, to justify his regression of the calendar and the commitments of Astana, his asking for giving time till the US positions become clear, and his call to be preferred to the Iranians in the Russian treatment, so he became weak after he was thinking that he is strong. Everything has changed from the gate of Manbej, Erdgoan became the first loser after he spent the costs of the collision with ISIS in Al-Bab and gained the enmity of the organization which he sponsored, all of that was to please the Americans in order to make him having the control on the Kurds. But the result as described by the Turks was that the Americans prefer the Syrian army to the allied Turkish one, and their acceptance of its entry to Manbej instead of the Turkish army not for the sake of the Kurds, but for the preparation to the war of Raqqa which the Syrian army has become the only capable force to wage it, and because it is present in its three fronts in Palmyra, Tedef, and Dei Al-Zour under the Russian sponsorship. Erdogan will face in Moscow castigation for his betrayal of the understandings, from his entry to Al Bab city to his regression of Astana commitments, his disabling Geneva negotiations, and his ignition of the escalation against the Iranian partner in Astana process to justify the getting out of it, but after the castigation, the Russians will say that who wants to wait the US position let him wait alone, because the developments will not wait for him. Moscow will not make use of the economic relations to exert pressure on Turkey and alienating it away from the political path, so Turkey has to choose between to wait or to join the political process with Russian ceiling quickly and clearly, otherwise Russia is going to abide by a military resolving path as in Aleppo which means with Iranian ceiling. Simply the issue depends on the presence of Syrian political military partner from the ranks of the opposition who is able to cover the participation in a government under the leadership of the Syrian President and in the war on ISIS and Al Nusra, where Turkey can reserve its seat. Otherwise there will be a war in Idlib and in the Southern of Syrian that ends the armed groups along with Al Nusra, and then the war on ISIS with the cooperation with the Americans and the Kurds, where there is no place for the Turks. Therefore the political process will be confined to those who attended Riyadh platform and the platforms of Moscow and Cairo. The mission of the Iranian President Sheikh Hassan Rouhani who will arrive to Moscow after Erdogan was the call to exert pressure on Turkey which manipulates with the positions, but this time he was excepted from that demand, since he achieved what he wanted. Moscow will present a cooperation agenda in Syria entitled the preparation to keep the balance under the tension of surprises as the Iranians were always asking for before. Without the progress of the Syrian in Palmyra and in the northern of Syria neither was the change in Manbej nor was the Turkish transition and perhaps the American one. The Russian political ceiling protects the settlements’ opportunities, while the Iranian military ceiling produces these opportunities, so Moscow has become convinced to proceed with them together, and that the escalated US speech does not exceed the media wars, as a result of what is going on in Manbej and the practical US attitude toward the deployment of the Syrian army, and what is going to happen in the battles of Raqqa, and as what has happened through the US overlook of the role of the popular crowd in Iraq despite the too much talk and what happened with the US ship USS in confronting the Iranian boats near the Strait of Hormuz unlike the media talk. Moscow is confident of the quantitative changes in the Syrian scene this year. – يصل الرئيس التركي رجب أردوغان إلى موسكو وقد تغيّرت مهمته، من التحريض على إيران وتبرير تراجعه عن روزنامة والتزامات أستانة وطلب إمهاله ريثما تتبلور المواقف الأميركية، والدعوة لتفضيله على الإيرانيين في المعاملة الروسية، فصار في وضعية الضعيف، بعدما ظن أنه في وضعية القوي. فقد تغير كل شيء من بوابة منبج وصارأردوغان الخاسر الأول، بعدما دفع أكلاف التصادم مع داعش في الباب واشترى عداوة التنظيم الذي رعاه، كل ذلك أملاً بكسب ودّ الأميركيين لتسليمه رأس الأكراد، وكانت النتيجة ما يصفه الأتراك بتفضيل الأميركيين للجيش السوري على الجيش التركي الحليف، وقبوله أن يدخل منبج بدلاً منه، لما هو أبعد من مراضاة ألأكراد بل التمهيد لحرب الرقة، التي صار الجيش السوري القوة الوحيدة القادرة على خوضها، والحاضرة في جبهاتها الثلاث من جهة تدمر وتادف ودير الزور، وكل ذلك برعاية موسكو وعلمها. – سيواجه أردوغان في موسكو تأنيباً لخيانته للتفاهمات، من دخوله مدينة الباب إلى تراجعه عن تعهّدات استانة وعرقلته مفاوضات جنيف، وافتعاله التصعيد مع الشريك الإيراني في عملية أستانة لتبرير الخروج منها، لكن بعد التأنيب سيقول الروس إن بمستطاع مَن يرغب بانتظار الموقف الأميركي أن ينتظرهم وحده، لكن التطورات لن تنتظره، وأن موسكو لن تستخدم العلاقات الاقتصادية للضغط على تركيا وستفصلها عن المسار السياسي ويعود لتركيا ىأن تختار بين الانتظار أو الانضمام لعملية سياسية بسقف روسي بسرعة ووضوح، وإلا فإن روسيا ذاهبة للالتزام بمسار حسم عسكري شبيه بحلب أي بسقف إيراني، وأن القضية ببساطة تتوقف على وجود شريك سياسي عسكري سوري من صفوف المعارضة قادر على تغطية المشاركة بحكومة في ظلّ الرئيس السوري وبالحرب على داعش والنصرة، فتحجز بهما تركيا دورها، وإلا حرب في إدلب وجنوب سورية تنهي هذه الجماعات المسلحة مع النصرة، وبعدها حرب على داعش بالتعاون مع الأميركيين والأكراد حليفهم المفضل، ولا مكان للأتراك فيها، وعملية سياسية تقتصر على مَن حضر من منصة الرياض مع منصتي موسكو والقاهرة. – الرئيس الإيراني الشيخ حسن روحاني الذي يصل إلى موسكو بعد أردوغان، كانت مهمته الدعوة للضغط على تركيا التي تتلاعب بالمواقف ليجد هذه المرة أنه بغنى عن هذا الطلب فقد حصل ما يريد، وأن موسكو ستطرح جدول تعاون في سورية عنوانه الاستعداد لإبقاء الميدان ساخناً صانعاً للمفاجآت كما كان يطلب الإيرانيون دائماً، فلولا تقدم الجيش السوري في تدمر وشمال سورية لما كان التغيّر في منبج ومنه التبدل التركي، وربما الأميركي، وأن السقف السياسي الروسي يحمي فرص التسوية والسقف العسكري الإيراني ينتج هذه الفرص، ولذلك فإن موسكو باتت مقتنعة بالسير بهما معاً، وأن الكلام الأميركي التصعيدي لا يتعدّى الحروب الإعلامية، بدليل ما يجري في منبج والموقف الأميركي العملي من انتشار الجيش السوري، وما سيجري في معارك الرقة، أسوة بما جرى في التغاضي الأميركي عن دور الحشد الشعبي في العراق رغم الكلام الكثير، وبما جرى مع السفينة الأميركية «يو اس أس» في مواجهة الزوارق الإيرانية قرب مضيق هرمز عكس الكلام الإعلامي كله. – موسكو واثقة من تغييرات نوعية في المشهد السوري هذا العام. العراق | العبادي يلاحق «داعش» في سوريا… تحت السقف الأميركي! BEIRUT, LEBANON (1:15 A.M.) – Unprecedented gains were acchieved in the eastern Aleppo countryside on Tuesday as the Syrian Arab Army (SAA) wrestled control of over 30 villages from ISIS in less than 24 hours. Moments ago, the SAA’s Tiger Forces also captured the town of Al-Sukhny, thus setting foot on the western bank of Lake Assad (Euphrates River) for the first time in five years. Effectively, the SAA’s offensive has almost entirely expelled ISIS from Aleppo province. In addition, the advances cancel any plans by the Kurdish-led ‘Syrian Democratic Forces’ about advancing towards Raqqa city from the western bank of the Euphrates River. As a token of appreciation, the SAA brought two bottles of Euphrates water to Russian generals at Kuweiris Airbase in show of gratitude for their air support. According to AMN correspondent Yusha Yuseef, the symbolic bottles will be flown to Moscow shortly. Next up, the Tiger Forces will strike southwards along Lake Assad until they encountered ISIS’ last defensive line on the axis between Jirah Airbase and Deir Hafer. Due to today’s SAA advancements, the Tiger Forces have not only lived up to their reputation as fearsome assault troops, but also arguably proven to be the most effective fighting force in the fight to defeat the Islamic State. How does Washington read: Palmyra, Tadef, and Raqqa? As a result of the Russian-US communication that followed the Russian-Syrian raids on the hills in the northeast of Tadef which the Syrian army and its allies entered, and then they proceeded toward the north after surpassing the points of deployment of the Turkish army in Al-Bab city, and which has led to the rise of the US concern because they were near the points of the deployment of troops trained by the Americans an understanding that led after mutual accusation and denial statements to the Russian-US cooperation to prevent any accident that may cause due to the lack of the coordination between the Syrian army and its allies on one hand, and the worked units under the US sponsorship or the Democratic Forces of Syria or the Committees of the Kurdish protection on the other hand. As the concerned follow-up resources say; the Americans expressed their surprise to the speed of the progress of the Syrian army and its allies along with their high professionalism militarily and their strategic plans in a smart timing toward the north battles and Palmyra battle, they described the encirclement of Palmyra and Tadef around Raqqa with the equation of a practical entry to the battle of Raqqa by the Syrian army that is no longer be ignored as a partner. And how this army which fights on ten deployed fronts in the Syrian geography since years is still has these competencies, capacities, vitality, and the ability to put the plans related to strategic visions not just emotional simulation of the reality of the field in defense and attack. The Kurdish leaderships which are concerned with the battle of Raqqa with the coordination of the Americans say that the technical, practical, and the human complexities which face this battle according to the Americans was a justification for the Americans to propose this cooperation with Turkey, but the Kurds refused this cooperation and asked for a decisive US position specially in terms that the Kurds are not ready to leave Manbej. They got clear US pledge that is translated by deploying US units there; nearly three hundred soldiers, they met the Kurdish demand with anti-aircraft missiles, which the Americans know that they will be used against the Turkish aircraft in case the Kurds are exposed to the risks of new confrontations, while the Kurdish leaders deny the hypothesis of reaching to tripartite understanding US -Kurdish-Turkish under US sponsorship to ensure the battle of Raqqa, as they deny strongly what is rumored about the success of the talks of the Head of the CIA in Ankara about this issue. They describe the battle of Al Bab according to the Turks with the trap which set by the Syrian army leaving them get stuck in it in order to prevent them from heading to Raqqa across Manbej. The Kurdish leaders add if the matters reached to zero-hour and that they have to choose an allied force that participates in the battle of Raqqa they would notify the Americans that they prefer to cooperate with the Syrian army within Russian US cooperation to any Turkish role. The entry of the Syrian army and its allies to the castle of Palmyra and its progress in it in order to have a full control on the city makes it at the gates of Raqqa and Deir Al Zour. During its entry later to Al Sokhna city its forces which reached to Tadef will meet with its other forces which move from Palmyra to the north, so Raqqa will be besieged with the Syrian army in the south and west and the Kurds in the east and north, as Deir Al Zour which be surrounded with the Syrian army in the west and south and the Kurds in the north, while the Iraqi popular crowd in the east. Therefore the Turks will be practically in front of difficult choices to impose their presence as the challenge of the process of the military incursion to the areas under the Kurdish dominance. It is an impossible matter in the light of the US cover and presence, and the Americans will be in front of the challenge of waging small unguaranteed battles that are subject to failure or to submit to the field need and to cooperate with the Syrian army after the name of the Free army has become mere a shadow of the Turkish army after the battles of Aleppo. – نتج عن التواصل الروسي الأميركي الذي أعقب غارات روسية سورية على تلال شمال شرق مدينة تادف التي دخلها الجيش السوري وحلفاؤه ويتقدّم منها صعوداً نحو الشمال بعد تخطّيه نقاط انتشار الجيش التركي في مدينة الباب، ما أثار قلقاً أميركياً لقربها من مناطق انتنشار قوات يدرّبها الأميركيون، تفاهمٌ أفضى بعد بيانات اتهام ونفي متبادلة إلى تعاون روسي أميركي لمنع أي حادث عائد لنقص التنسيق بين الجيش السوري وحلفائه من جهة والوحدات العاملة تحت المظلة الأميركية أو قوات سورية الديمقراطية ولجان الحماية الكردية من جهة أخرى. – عبّر الأميركيون، كما تقول مصادر متابعة ومعنية عن دهشتهم لسرعة تقدّم الجيش السوري وحلفائه ومهنيّتهم العالية عسكرياً وخططهم الاستراتيجية بتوقيت ذكي لمعارك الشمال ومعركة تدمر ووصفوا طوق تدمر وتادف على الرقة، بمعادلة دخول عملية إلى معركة الرقة من جانب الجيش السوري لم يعُد ممكناً تفاديه خلالها كشريك، وكيف أن هذا الجيش الذي يقاتل على عشرات الجبهات المنتشرة منذ سنوات على الجغرافيا السورية لا يزال يملك هذه الكفاءات والقدرات والحيوية والقدرة على وضع الخطط المرتبطة برؤى استراتيجية وليست مجرد محاكاة انفعالية لواقع الميدان دفاعاً وهجوماً. – تقول القيادات الكردية المعنية بمعركة الرقة بالتنسيق مع الأميركيين أن التعقيدات الفنية والعملية والبشرية التي تعترض طريق هذه المعركة بنظر الأميركيين كانت مبرّر الأميركيين لعرض التعاون مع تركيا، وأن الأكراد رفضوا هذا التعاون وطلبوا موقفاً أميركياً حاسماً، خصوصاً لجهة عدم استعداد الأكراد لمغادرة منبج، وحصلوا على تعهّد أميركي واضح ترجم بنشر وحدات أميركية هناك تقارب ثلاثمئة جندي، ولبّوا طلباً كردياً بصواريخ مضادة للطائرات يعرف الأميركيون انها ستستخدم ضد الطائرات التركية في حال تعرّض الأكراد لمخاطر مواجهات جديدة. وينفي القادة الأكراد فرضية التوصل لتفاهم ثلاثي كردي تركي برعاية أميركية لضمان معركة الرقة، كما ينفون بشدة ما يُشاع عن نجاح محادثات مدير المخابرات الأميركية في أنقرة حول هذا الشأن، ويصفون معركة الباب من الجانب التركي بالفخ الذي نصبه الجيش السوري وتركهم يعلقون فيه ليغلق عليهم طريق الباب إلى الرقة عبر منبج. ويضيف القادة الأكراد أنه إذا وصلت الأمور لساعة صفر وكان يجب اختيار قوة حليفة تشارك معركة الرقة، فهم سيبلغون الأميركيين أنهم يفضلون التعاون مع الجيش السوري ضمن تعاون روسي أميركي على أي قبول بالدور التركي. – دخول الجيش السوري وحلفائه إلى قلعة تدمر وتقدّمه منها لإحكام السيطرة على المدينة، يجعله على بوابتي الرقة ودير الزور، ومع دخوله مدينة السخنة في وقت لاحق ستلتقي قواته التي وصلت تادف بقواته الصاعدة من تدمر شمالاً، وتصير الرقة بين فكّي كماشة، الجيش السوري جنوباً وغرباً والأكراد شرقاً وشمالاً، ومثلها تصير دير الزور بين الجيش السوري غرباً وجنوباً والأكراد شمالاً والحشد الشعبي العراقي شرقاً، ويصير الأتراك عملياً أمام خيارات صعبة لفرض حضورهم، بحجم تحدّي عملية اجتياح عسكري لمناطق سيطرة الأكراد، وهو أمر مستحيل في ظل التغطية والوجود الأميركيين، ويصير الأميركيون أمام تحدّي خوض معارك صغيرة غير مضمونة ومعرضة للفشل، أو الرضوخ للحاجة الميداينة والتعاون مع الجيش السوري بعدما صار مسمّى الجيش الحر مجرد ظل للجيش التركي بعد معارك حلب. South of Al-Bab the Syrian army is moving towards the Euphrates. It will cut off the Turkish forces path to Raqqa and Manbij. That move concluded. The Turkish invasion forces are now blocked from moving further south. They would have to fight the Syrian army and their Russian allies to move directly onto Raqqa. They would have to fight the Syrian-Kurdish YPG and its U.S. allies to move further east. For the first time since the start of the war the supply lines between Turkey and the Islamic State are cut off! Erdogan is still hoping for U.S. support for his plans for Raqqa but I doubt that the U.S. military is willing to give up on their well regarded Kurdish proxies in exchange for an ill disciplined Turkish army in general disarray and with little fighting spirit. Erdogan removed any and all officers and NCOs that he perceived as not being 100% behind his power grab. That has now come back to haunt him. He is lacking the military means to pursue his belligerent policies. Last year Erdogan had allied with Russia and Iran after a (U.S. supported?) coup attempt against him failed. He felt left alone by the U.S. and its reluctance to support his plans in Syria. After Trump was elected Erdogan perceived a coming change in U.S. policies. He exposed himself as the ultimate turncoat and switched back to a U.S. alliance. His believe in a change of U.S. policy drives his latest moves and announcements. Elijah Magnier reports that his sources in Damascus have the same impression of Trump as Erdogan. They believe that Trump will strongly escalate in Syria and will support the Turkish moves against the Syrian state. But it is the U.S. military that drives the strategy in the Trump cabinet. The Pentagon has no appetite for a big ground operation in Syria. The plan it offered Trump is still the same plan that it offered under Obama. It will work with Kurdish forces to defeat the Islamic State in Raqqa. Notable is also that a director of the Pentagon financed think tank RAND Corp publicly argues for better cooperation with Russia in Syria. The old RAND plan of a decentralized Syrian with zones under “international administration” (i.e. U.S. occupied) is probably no longer operative. Recently Erdogan announced that his next move in Syria would be to towards Manbij, held by the YPK. Shortly thereafter pictures of U.S. troops in Manbij displaying U.S. flags were published on social networks. The message was clear: stay away from here or you will be in serious trouble. On Monday planes from the Iraqi air force attacked Islamic State positions within eastern Syria. The attack followed from intelligence cooperation between Syria and Iraq. It is easier for Iraq to reach that area than for Syrian planes stationed near the Mediterranean. This cooperation will continue. In western Iraq militia integrated with the Iraqi military are ready to storm Tal Afar. This is besides the besieged Mosul the last big Islamic State position in the area. The U.S. had planned to let the Islamic State fighters flee from Mosul and Tal Afar towards Syrian and to let them take the Syrian government positions in Deir Ezzor. Syrian-Iraqi cooperation blocked that move. The U.S. attempt to separate the war on the Islamic State in Syria and Iraq failed. Any attempt to again use the Islamic State as a means to destroy Syria will meet resistance in Iraq where the U.S. is more and more engaged. U.S. commanders in Iraq will be well aware of that threat. In my opinion Trump’s more belligerent remarks on Syria, on safe zones and military escalation, are rhetoric. They are his negotiation positions towards Russia and Iran. They are not his policies. Those are driven by more realistic positions. Obama balanced more hawkish views supported by the CIA, Hillary Clinton and the neoconservatives against reluctance in the military to engage in another big war. Trump will, even more than Obama, follow the Pentagon’s view. That view seems to be unchanged. I therefore do not believe that aggressive escalation is the way Trump will go. Some additional U.S. troops may get added to the Kurdish forces attacking Raqqa. But any large move by Turkish or by Israeli forces will not be condoned. The big U.S. invasion of Syria in their support will not happen. Meanwhile the Syrian army is moving on Palmyra and may soon retrieve it from the Islamic State. A new Russian trained unit, the 5th corps, is in the lead and so far makes a good impression. With Palmyra regained the Syrian army is free to move further east towards Raqqa and Deir Ezzor. 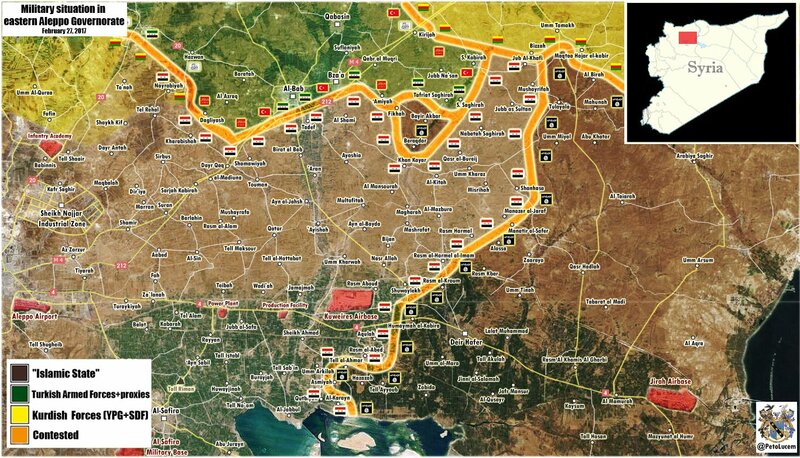 Erdogan may still get some kind of “safe zone” in the area in north Syrian his forces now occupy. But Damascus will support Kurdish and Arab guerilla forces against any Turkish occupation. The Turkish forces in Syria will continue to be in a lot of trouble. Erdogan will not get active U.S. support for further moves to capture Syrian land. His change of flags, twice, was useless and has severely diminished his standing. Netanyahoo and the Israel lobby also want a “safe zone”. This one in south Syria and under Jordanian command. This would allow Israel to occupy more Syrian land along the Golan heights. But the areas next to the Golan and towards Deera are occupied by al-Qaeda and Islamic State aligned group. These groups are a serious danger for the unstable Jordanian state. There is nothing to win for Jordan in any “safe zone” move. Likewise the U.S. military will have no interest in opening another can of worms in south Syria. Like Erdogan Netanyahoo will likely be left alone with his dreams.